Sprint Samsung Instinct Software Update being released Today? The Instinct has been available for a little over a week now. While I do like the device, there are a couple of things I'd change. Before making those comments here, I'd like to see what gets fixed with a software update. The rumor making the rounds is that there will be an update available today. To check, do the following: Press the home icon and tap main. Tap settings, then tap general, scroll down and tap update software. With any luck, the rumor is true and the steps above will allow you to download the update. If so, feel free to post your experience and comments. Genius is a company that makes some pretty cool products. Here is an announcement regarding one of their newest peripherals. MIAMI (June 24, 2008) –Genius (www.geniusnetusa.com), a division of KYE Systems Corp., announced today a new speaker system that has a touch panel screen to control function, volume, bass or treble all with the touch of a finger. Combing fun with great sound, everything is controlled right from the front of the speaker. The adjustable light for the slide bar illuminates when adjustments are made to the SP-T1200, creating a high-tech look and feel. The compact size, mixed with 30-watt sound, make these speakers the perfect companion for laptops and notebooks of all kinds. 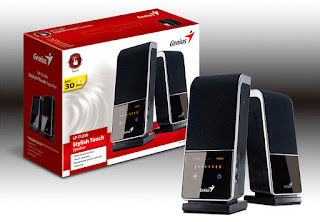 Priced at $99.00 MSRP, the 2.0 Touch Speaker System comes in black-onyx for a contemporary look and feel. Perfect for gaming or listening to music in-between class or while on the road, these new speakers are easy and fun to use. The touch panel speaker also features a jack for headphones, audio cable and an accessible “mute” button to turn off the sound when needed. 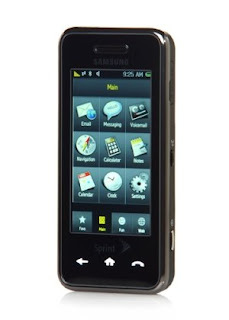 The SP-T1200 are currently available at New Egg.com, Amazon.com, Mac Mall, Tiger Direct, Buy.com or other retailers and distributors listed at http://www.geniusnetusa.com/buy.php. The good folks at ePocrates have come up with an interesting idea. Currently 50% of doctors carry and use some type of mobile device and can't imagine living without it. The other 50%, however, may need help in entering the digital realm. To that end, ePocrates has set up a web site ePocrates Go Mobile. The idea behind the site is to help those looking ot start down the digital path. The site includes device comparisons, peer recommendations and technology benefits. The hope is that this online resource will help make the transition easier for those doctors looking to go mobile with a digital device. If you are interested in technology, but have yet to make the jump to some type of portable device, take a look at ePocrates Go Mobile. The site can definitely be of help. Sirona Dental Systems Presents Block Party Live! Long Island City, NY (June 25, 2008) – Sirona Dental Systems, Inc., the company that pioneered digital dentistry more than 20 years ago and the world’s leading producer of dental CAD/CAM systems, is pleased to announce a series of over 40 nation-wide Ivoclar Vivadent Block Parties that will be presented throughout October. The exclusive programs will provide exciting opportunities to experience the latest break-throughs in CAD/CAM technology, techniques, and materials from Sirona and one of its leading material partners, Ivoclar Vivadent. Specialists from Sirona and Ivoclar will be on-hand to provide hands-on informative demonstrations such as the fabrication of advanced restorations using leading edge all-ceramic materials IPS e.max® CAD blocks and IPS Empress® CAD blocks, as well as dynamic presentations on the world’s largest digital dental network, Sirona’s CEREC® Connect and the inLab® MC XL milling unit. Observe full contour restorations being fabricated with less than 15 minutes of labor – and less than 1 hour from start to finish! Dental professionals will receive 2 continuing education credits for each program attended. Admission is FREE and refreshments will be served. For more information about the next Block Party in your area, please contact your local Patterson or Sirona representative. TRICOR Systems Inc. (Elgin, IL) today announced Medical Device & Diagnostic Industry (MD&DI) magazine has selected the Single Tooth Anesthesia (STA) delivery system as a winner of the 2008 Medical Design Excellence Award (MDEA) in the "dental instruments, equipment and supplies" product category. Of the 33 products to receive an MDEA this year, TRICOR’s design of the STA system was one of only two winning products that serve dental practitioners. 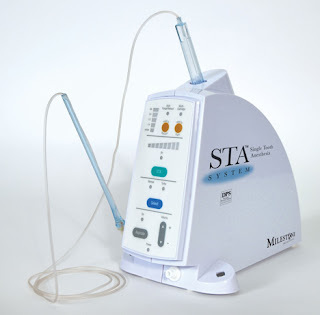 Single Tooth Anesthesia (STA) delivery system is the first imbedded computer-controlled local anesthetic system where just one injection at a single tooth is all that is needed. No longer will a dental patient have to endure a half numb-mouth. "Everyone at TRICOR Systems is honored to be selected to receive the Medical Design Excellence Awards. It not only validates our team’s hard work in conceptualizing, designing and manufacturing an innovative and industry changing product, but shows that TRICOR Systems will continue to have an impact in the development of new medical devices for a long time to come" said Thomas Allen, Sales and Marketing Manager of TRICOR Systems. Founded in 1976, TRICOR Systems Inc. has been focusing on helping medical start-up companies bring their ideas to market for the past 12 years. TRICOR’s in-house engineering and manufacturing allows them to provide a turnkey solution for companies looking for an electro / mechanical contract equipment manufacturer. The award ceremony will be held June 4, during the Medical Design and Medical Manufacturing East 2008 Conference and Exposition at the Jacob K. Javits Convention Center in New York City. By 2015—when the National Health Information Infrastructure will be operational—a patient's dental record will no longer travel alone. Dental records will be included within electronic health records that also include patients' entire medical histories, pharmacy, vision, laboratory tests and all other clinical information. EHRs will travel from health care provider to health care provider on the NHII, a communications system often described as a network of information highways. Although not widely discussed within the general membership to date, the development of the electronic health record will likely be the most challenging and ultimately defining initiative the ADA deals with in the next 5-10 years. Those working to ensure dentists are prepared say that with only six years left until this dramatic change, 2015 is just around the corner. Although it was the Bush administration that in 2004 set the goal and timeline for electronic health records for Americans, a fully compatible national health information infrastructure is gathering bipartisan support. "We can expect a national strategy for managing and communicating patient information as the electronic health record initiative moves forward," says ADA President Mark Feldman. Dr. Feldman also serves on the Electronic Health Record Workgroup. "The ADA will advocate to keep compliance scalable for a small business operation and keep our members informed of what they will need to do to comply." The federal government's intent is to increase information technology to promote overall quality and cost reduction of the entire health care system. The HHS, under whose purview the NHII falls, defines it as "an initiative set forth to improve the effectiveness, efficiency and overall quality of health and health care in the U.S."
Electronic health records for patients have to be consistent, have to speak the same language to get the information across to different types of health care providers. Standards that can make patient information accessible to any health care provider and enable that information to cross practice management and software systems from different vendors are necessary to achieve interoperability. A working group of the ADA Standards Committee on Dental Informatics developed the standard that creates the interoperability necessary for dentists to communicate information in electronic patient records to all health care providers—American National Standards Institute/ADA Specification No. 1000 Standard Clinical Data Architecture for the Structure and Content of an Electronic Health Record. "The bottom line in achieving interoperability is that you have to be able to compare apples to apples," explains Dr. Robert Ahlstrom, a practicing dentist who serves on the ADA Standards Committee on Dental Informatics and the Council on Dental Practice, as well as both the EHR Workgroup and the SNODENT Editorial Panel. The ADA in 2005 established the NHII Task Force to establish the role of the ADA in developing access, content, standards and code vocabularies for dentistry in the electronic health record and said in its report to the 2006 House of Delegates, "in order to make the NHII successful within dentistry, SNODENT must be reviewed, refined and tested." SNODENT—Systemetized Nomenclature of Dentistry—is the vocabulary designed for electronic health and dental records. The NHII Task Force evolved into the EHR Workgroup. The ADA SNODENT Editorial Panel is charged with updating clinical terminology to make SNODENT interoperable with the rest of the electronic health record. All information captured in the EHR must be codified to ensure interoperability between computer systems. As part of its duties, the EHR Workgroup is monitoring and supervising the activities of the SNODENT Editorial Panel. There are at least nine different code sets that have been identified that need to be part of an electronic dental record. This will involve the work of most ADA councils, as well as the ADA legal, standards and information technology areas, dental specialty groups and others. As well, the ADA will continue to negotiate for the Association's ability to produce and protect the clinical code sets as its own intellectual property. "It's a vast and complex project," says ADA 3rd District Trustee William Glecos, chair of the EHR workgroup. "Many groups have important parts to play in the development of the dental portion of the electronic health record and it will take a significant commitment from all those working on the project to get this done." The ADA Board of Trustees June 9 approved a resolution to go to the 2008 House of Delegates calling for the ADA to sponsor a meeting on EHR development and include the nine nationally recognized specialty organizations, the Academy of General Dentistry and other dental or medical organizations that are stakeholders in the dental portions of the health record. ADA leaders say dentists will be the ones to establish the importance of oral health as part of overall systemic health and so dentists will define the standards and taxonomies needed to provide the content for dentistry as part of the NHII network. "Ultimately, and beyond the development of interoperability standards, dentists will be encouraged to acquire the technology necessary to utilize the EHR to share patient information in a secure manner," observes Dr. Robert Faiella, ADA 1st District trustee and a member of the EHR workgroup. "This will allow us to have accurate past medical and dental histories, drug profiles and interaction, laboratory results and improve patient safety." Adds Dr. Faiella, "It will govern not only our access to vital information, but also change how we are reimbursed by third party carriers, and eventually, may impact the resale value of our practices upon retirement based on technological capability." As the evidence of crossover between medical and dental conditions continues to emerge, ADA advocates for members see the electronic health record as essential in determining treatment and evaluating outcomes. As dentistry moves to a system of medically managing oral disease, dentists may find that electronic health records provide valuable data on their patients' medical conditions, current prescription medicines and potential drug interactions. For an example, saliva testing is already being used in many states as part of key diagnostics for patient pharmaceutical compliance, substance abuse and disease monitoring. Some electronic patient records include saliva testing and monitoring and plotting of these under the laboratory section of the chart to correlate the results to drug dosages or treatments. "The initiative demands our attention to the importance of technology in the practice of dentistry within the scope of overall health care," observes Dr. Faiella. "We will likely have an expanded code taxonomy—procedural, diagnostic and administrative—as part of our routine practice in an electronic format." Those advocating for ADA members are aware that the idea of applying standardized code sets—which include diagnostic coding necessary in order to establish interoperability with existing medical code models—turns many dentists off. But they say the advantages outweigh any disadvantages, particularly because diagnostic coding will be developed by the ADA. "If there exists a mandate for the development of a diagnostic code set, it is the duty of the ADA to develop that code set, to do whatever it can to ensure that the process and the ultimate code set is as fair-minded, patient protection oriented and as user-friendly as is humanly possible, and employs reasonable safeguards against confusion, misinterpretation and abuse," says Dr. Joseph Hagenbruch. Dr. Hagenbruch serves on the EHR workgroup and the SNODENT Editorial Panel, as well as the Council on Dental Benefit Programs. I've received some inquires regarding the compatibility of the Instinct with ePocrates. While there is currently not a downloadable version, I have a work around that is so far working quite nicely for me. Simply purchase the ePocrates online version which gives you web access. That way you can easily access the ePocrates website over the hi speed data connection. The Instinct's web browser will easily and quickly render the site which gives you the same information that is available for a PDA format. The good news about this, is not only can you now access ePocrates on your portable device, but you can also access it anywhere you have a computer. Since most dental professionals are not mobile this is a simple and effective solution. If ePocrates does decide to offer an Instinct version, you'll know about it the moment that I do! cruising altitude with a new, personalized in-flight entertainment system. connectivity in first and business class. experiences more relaxed and enjoyable." for United to roll this out to their fleet." newly-configured international aircraft, as well as games and XM radio. A short post for today as I've got a million things on my plate. Many people are concerned about keeping Windows XP up and functioning since Microsoft has stated they are not supporting the operating system any more after June 30th. There are ways around that and I stumbled across a good article on PCWorld that details it very well. Well, the day is finally here. Sprint has brought its iPhone competitor the Instinct, by Samsung, to market. I've been jazzed about this phone since I first read about it several months ago and have eagerly awaited a chance to get my paws on one. Since I didn't want to leave the Sprint network, this phone is the only option for me. I am the iPhone dream customer, but its exclusive availability on AT&T was a deal breaker for me personally. Since I knew that I would be getting one, I registered with Sprint and they sent me an e-mail earlier this week that gave me the privilege of getting one the day before the official launch. So last night I was in the store getting my new Instinct. One of the nice things Sprint now does in their stores is allow you to set up an appointment. I walked in the store at 8:25 pm last night and although there were several people already there, I was told "you'll be the next one we call". Sure enough at 8:30 a rep called my name. I had to change plans to get the Instinct (I wasn't real crazy about that, but it is what it is) and I also had a couple of other questions and situations to deal with including upgrading my broadband wireless device for my computers for travel. I was in the store a total of 45 minutes completing the transaction. The rep was efficient and friendly. He even transferred my contacts from my Treo 700P to the Instinct. Although it's been less than 12 hours, here are my first impressions. I'll state for the record that I have limited experience with the iPhone so these are my takes based on what I feel about the Instinct as a new device and not as an iPhone competitor. Packaging: Slick and very nice. I'm always impressed when I buy an Apple product with the way the packaging is done. A good job was done to make the packaging solid and have a "quality" feel to it. Device: Solid feel. Screen is quite bright and beautiful. The touchscreen seems very responsive. Feels great in my hand. Has a removable battery (I love that). The device was fully charged right out of the box and took only moments to get on the network as my settings were ported over from my old phone. Accessories: Comes with a wired headset, a spare battery, a spare battery charger, AC adapter, USB adapter that also charges, and a carrying case. Pretty much everything you need other than a car adapter. I'm hoping that iGo has an adapter for it so that I won't need to purchase a car adapter that costs a tad over $30. Interface: I like it. It's a clean and easy to use system. Even though it comes with a fairly complete instruction manual, I really haven't had to use it. I'm finding the whole thing easy to navigate and figure out on the fly. I'll post more as I get more experience, but for now, it's hats off to Sprint for a great customer experience (we need more of these in the wireless industry) and a beautiful device. I got an e-mail from the folks at CollegeDegrees.com They have an article posted on accessing parts of your Amazon Kindle that you may not even know existed. Things like a clock, pseudo-GPS, a picture viewer and more can be easily accessed. Read the article here. Then after you've had a chance to try some of these things leave a comment here and let everyone know how it went. The Kindle has become one of those "must have" gadgets for me. These little tidbits make it even better. CHARLOTTE, NC – June 17, 2008 – Sirona Dental Systems, LLC (NASDAQ: SIRO), the company that pioneered digital impressions more than 20 years ago, and the world’s leading producer of dental CAD/CAM systems, today announced that it has become an American Academy of Cosmetic Dentistry Charitable Foundation (AACDCF) Diamond Sponsor and Advisory Council Member. AACDCF’s primary program Give Back A Smile (GBAS) provides free consultation and dental treatment to restore the smiles of domestic violence survivors. appreciated and clearly demonstrates the company’s commitment to the AACDCF and GBAS,” said AACDCF Director Erin Roberts. • Develop a program to assist dental offices in early detection of domestic violence. The AACDCF Advisory Council will present its recommendations and findings before the AACDCF Board of Trustees. Recognized as a leading global manufacturer of technologically advanced, high-quality dental equipment, Sirona has served equipment dealers and dentists worldwide for more than 125 years. Sirona develops, manufactures and markets a complete line of dental products, including CAD/CAM restoration equipment (CEREC® and inLab®), digital and film-based intraoral, panoramic and cephalometric X-ray imaging systems, dental treatment centers and handpieces. Sirona’s worldwide headquarters is located in Bensheim, Germany, with U.S. headquarters in Charlotte, North Carolina. Visit http://www.sirona.com for more information about Sirona and its products. The light from a diode laser is created by passing an electrical current through 2 dissimilar inorganic semiconductor materials. This approach has worked well over the years, but it has been limiting in the spectrum that can be emitted. Now scientists are looking into a material called polydioctylfluorene that may change things. It seems that most plastics cannot support the continuous electrical charge passing through them to create a laser light wavelength, but polydioctylfluorene is showing great promise. The material emits light in the blue range and is 200 more times more efficient than previous materials. Conventional electrically-powered laser diodes used in everyday consumer goods like DVD players are currently based on inorganic semiconductor materials such as gallium arsenide, gallium nitride and related alloys. The term 'semiconductor' describes the material’s ability to pass an electric current, which lies somewhere between that of a metallic conductor and that of an insulator. In the case of a laser diode, the current comprises positive and negative charges that combine inside the material and produce the initial light required to begin the lasing process. If the initial light can be forced to pass back and forth through the semiconducting material many times, in a way that amplifies its strength on each pass, then after a short time a spectrally narrow, intense and directional laser beam emerges. The last two decades have seen tremendous developments in new organic-molecule-based semiconductors, including a special class of plastics. Many important devices based on such plastics have successfully been developed, including light emitting diodes for displays and lighting, field effect transistors for electrical circuits, and photodiodes for solar energy conversion and light detection. However, despite over a decade of worldwide research, plastic laser diodes remain the only major device type not yet demonstrated. One of the main stumbling blocks is that, until now, it was widely considered that plastic semiconductor laser diodes would be impossible to produce because scientists had not found or developed any plastics that could sustain a large enough current whilst also supporting the efficient light emission needed to produce a laser beam. Now a team of Imperial physicists, publishing their findings in Nature Materials in April, have done just that. The plastics studied, synthesised by the Sumitomo Chemical Company in Japan, are closely related to PFO, an archetype blue-light emitting material. By making subtle changes in the plastic's chemical structure the researchers produced a material that transports charges 200 times better than before, without compromising its ability to efficiently emit light - indeed the generation of laser light was actually improved. The Sirius-XM merger cleared another hurdle and is now closer than ever to becoming a reality. The merger (which I can barely wait for) will combine the 2 companies and provide a much better customer experience from the content side. As a XM subscriber for a few years now I've come 180 degrees on my feelings about satellite radio. I was once a staunch opponent of paying for something I could get for free until I realized about 20 minutes of every hour of terrestrial radio is filled with commercials. Since I've been an XM subscriber I've wondered how I managed all those years without it. The full scoop from CNN Money can be read here. Interesting press release from the Sprint XOHM project. Sprint and Clearwire also announced today that five innovative technology, content and communications leaders - Intel Corporation (NASDAQ: INTC) through Intel Capital, Google Inc. (NASDAQ: GOOG), Comcast Corporation (NASDAQ: CMSCA, CMCSK), Time Warner Cable Inc. (NYSE: TWC), and Bright House Networks - have collectively agreed to invest $3.2 billion into the new company. The investment by the five strategic investors will be based on a target price of $20.00 per share of Clearwire's common stock, subject to a post-closing adjustment. This adjustment is based upon the trading prices of new Clearwire common stock on the NASDAQ Market over 15 randomly selected trading days during the 30-trading day period ending on the 90th day after the closing date. The price per share will be based upon the volume weighted average price on such days and is subject to a cap of $23.00 per share and a floor of $17.00 per share. In addition, Trilogy Equity Partners, led by wireless veteran John Stanton, will invest directly in the new Clearwire's common stock. "For Sprint shareholders, this is an opportunity to unlock and bring visibility to the value of our significant spectrum assets, technology and expertise, by leveraging the technology, applications and distribution strengths of our investors, who together command nearly a half- trillion dollars in market capitalization," said Dan Hesse, president and chief executive officer of Sprint. "We've made an excellent start developing XOHM WiMAX services. Contributing those advances to a strongly backed new company - in which we'll hold the largest interest - provides Sprint with additional financial flexibility and allows Sprint management to leverage and focus on our core business. Clearwire Chairman Craig O. McCaw, said, "The power of the mobile Internet, which offers speed and mobility, home and away, on any device or screen, will fundamentally transform the communications landscape in our country. We believe that the new Clearwire will operate one of the fastest and most capable broadband wireless networks ever conceived, giving us the opportunity to return the U.S. to a leadership position in the global wireless industry." Benjamin G. Wolff, chief executive officer of Clearwire, said, "The combination of robust next- generation mobile WiMAX technology and nationwide spectrum that we believe is optimal for delivering mobile broadband services - coupled with substantial new financial resources, a team of experienced wireless industry veterans, and distribution and technology agreements with some of our nation's leading communications, technology and content companies - creates what I believe to be a once-in-a-lifetime opportunity. Critical links between periodontal (gum) disease and the development of type 2 diabetes, as well as the development and progression of its complications, were reported here in the first ever symposium presented by dentists to diabetes experts at the American Diabetes Association's Annual Scientific Sessions at its 68th such event. "One of the many complications of diabetes is a greater risk for periodontal disease,"said Maria E. Ryan, DDS, PhD, Professor of Oral Biology and Pathology, and Director of Clinical Research, School of Dental Medicine, Stony Brook University, New York, in a recent interview. "If you have this oral infection and inflammation, as with any infection, it's much more difficult to control blood glucose levels." Intensive periodontitis treatment significantly reduces levels of A1C, a measure of glucose control over the prior two to three months. These links between oral and systemic health may start even before clinical diabetes begins. "We have found evidence that the severity of periodontal disease is associated with higher levels of insulin resistance, often a precursor of type 2 diabetes, as well as with higher levels of A1C, a measure of poor glycemic control of diabetes," she said. The importance of these findings were emphasized by her colleague, George W. Taylor, DrPH, DMD, Associate Professor of Dentistry, Schools of Dentistry and Public Health, University of Michigan. "Several recent studies have shown that having periodontal disease makes those with type 2 diabetes more likely to develop worsened glycemic control and puts them at much greater risk of end-stage kidney disease and death," he reported. "Given the numerous medical studies showing that good glycemic control results in reduced development and progression of diabetes complications, we believe there is the potential that periodontal treatment can provide an increment in diabetes control and subsequently a reduction in the risk for diabetes complications,"said Dr. Taylor. Nearly 21 million Americans have diabetes, a group of serious diseases characterized by high blood glucose levels that result from defects in the body's ability to produce and/or use insulin. Diabetes can lead to severely debilitating or fatal complications, such as heart disease, blindness, kidney disease, and amputation. It is the fifth leading cause of death by disease in the U.S. Type 2 occurs mainly in adults who are overweight and ages 40 and older. "In an analysis of the National Health and Nutrition Examination Survey of the U.S. population data from 1988-94, we recently found that people with periodontal disease were twice as likely to have insulin resistance than those without such disease,"said Dr. Taylor. This result was found after controlling for other characteristics that would be associated with insulin resistance, such as obesity, lipids, exercise, and other markers of inflammation, such as CRP, and whether or not they had diabetes. In an unpublished study at the General Clinical Research Center at Stony Brook University, a group of individuals who were by one measure â€" RD values (a measure of glucose uptake and insulin sensitivity) -- insulin resistant, and likely had pre-diabetes, also had their oral health assessed. Their degree of insulin resistance directly correlated with the severity of their periodontal disease. "The inflammation from the oral cavity may be contributing to the insulin resistance in this patient population,"said Dr. Ryan. Also measured in this group were levels of cytokines, such as IL-1 beta, which are pro-inflammatory mediators involved in the long-term diabetes complications. "Genetic testing revealed that 50% of the insulin resistant patients had an IL-1 polymorphism -- in contrast to 20% in the overall population, meaning that they are genetically susceptible to an excessive inflammatory response, and this 50% was the group that had high levels of insulin resistance and more severe periodontal disease,"she said. "We think periodontitis may adversely affect glycemic control because the pro-inflammatory chemicals produced by the infection -- such as IL-1-beta, IL-6, and TNF-alpha -- could transfer from the gum tissue into the bloodstream and stimulate cells to become resistant to insulin," said Dr. Taylor. "Then insulin resistance prevents cells in the body from removing glucose from the bloodstream for energy production." "A recent set of observational studies of the Pima Indians in the Southwest, a population with a very high rate of type 2 diabetes, investigated whether those with periodontitis are more likely to develop poorer glycemic control,"said Dr. Taylor. "We found that those with periodontitis were more than four times as likely to develop worsened glycemic control after two years of follow-up." "Just as periodontal disease makes diabetes worse, the reverse also appears to be true, with improvements in periodontal disease benefiting diabetes control," said Dr. Taylor. "We conducted an NIH-funded, randomized clinical trial in 46 people with type 2 diabetes and, 15 months after routine periodontal treatment, found a statistically significant reduction of 0.67% in A1C levels," said Dr. Taylor. "We recently published a randomized, placebo-controlled, 30-patient study done at the General Clinical Research Center at Stony Brook University showing that a sub-antimicrobial dose of doxycycline, during and after root planing, as part of a 9-month course of treatment, significantly reduced A1C by 1% and also reduced proteinuria, a marker of diabetic kidney disease, and CRP, a marker of inflammation," said Dr. Ryan. "It also significantly reduced pocket depths associated with periodontitis and enabled gains in clinical attachment, while reducing signs of inflammation, such as bleeding upon probing or brushing." Two confirmatory 3-month studies of this program developed at Stony Brook have been conducted, at Columbia University and Buffalo University with 150 patients, and presented at International Association for Dental Research meetings. "When glycemia has been difficult to control, the physician might consider asking patients when they last saw their dentist, whether periodontitis has been diagnosed and, if so, whether treatment has been completed,"said Dr. Ryan. "A consultation with the dentist may be appropriate, to discuss whether periodontal treatment has been successful or whether a more intensive approach with oral or sub-antimicrobial antibiotics is in order because, just as it is difficult to control diabetes while the patient has an infected leg ulcer, the same applies when there's infection and inflammation of the gums." I've been pretty busy this week and haven't had a chance to run this story down. Here is the press release. I'll be having a conversation with my friends at Eaglesoft this afternoon, if anyone has any questions they'd like me to ask, please send them to me. first-of-its-kind, industry-leading initiative, Patterson Dental Supply, Inc. announces it will now provide Patterson EagleSoft practice management software to dental professionals nationwide at no charge. The award-winning software, along with the data import process and CD-ROM and Web-based training materials, are available for free beginning June 9. As a multitude of digital technologies become mainstream in the dental practice, Patterson Dental recognizes the basic, fundamental need for a cutting-edge software to be the hub of that digital future. Delivering solid integration throughout the dental practice, free Patterson EagleSoft practice management software helps dental professionals streamline practice activity, ultimately benefiting patients and staff, alike. "Providing Patterson EagleSoft practice management software at no cost eliminates a major hurdle for dentists seeking better software or looking ahead toward future digital technology purchases," said Patterson Dental President Scott Anderson. "Patterson Dental's primary focus is helping dentists stay on the forefront of technology and working to ensure practitioners have access to practice management software that allows easy integration with evolving digital technologies." CERRITOS, Calif. (June 24, 2008) – Plustek Technology Inc. (www.plustek.com), a manufacturer of consumer, professional and office imaging devices, is pleased to announce its extension in the large-format scanner arena with the launch of the Plustek OpticPro A360. Following the heels of the widely popular OpticPro A320, the A360 is designed to offer professional results, including seven one-touch scan buttons to simplify and automate the most common scanning functions (i.e. scan, OCR, copy, fax and email) and a hyper-fast scanning speed of 2.4 seconds. The new scanner from Plustek is debuting in the US in early May. Plustek’s OpticPro A360 takes the pain out of large format scanning through speed and adaptability. Microsoft Vista-compatible, this high-speed USB 2.0 scanning device can scan an A3 size document at high quality in a blazing fast 2.4 seconds. To satisfy any user, from novice to prosumer, the scanner comes bundled with highly effective image processing and document management software, including I.R.I.S. Readris 10 Pro Corporation Edition. The bundled software allows for the latest titles for fast and secure PDF conversion, highly accurate optical character recognition (OCR) and easy sharing of files over a network. The improved engine makes for improved images and faster scanning speeds for the professional workplace. These features make it the ideal scanner for graphic designers, publishing companies, libraries, schools, small office/home office (SOHO) users and for those who regularly require large format scanning such as; financial institutions, government agencies, libraries, museums, educational departments, corporate enterprises, legal firms, architectures, and medical offices. With an estimated street price (ESP) of $1199, the Plustek OpticPro A360 Scanner is an affordable image solution for small businesses and is now available worldwide. Renamel NANO recently received its second award as one of the best new products of 2008. Renamel NANO is a universal composite that you can use both anteriorly and posteriorly without compromising on the end esthetic result. Renamel NANO is a light-cured nano-hybrid composite that is 80% filled, resulting in stronger and longer lasting restorations. The unique Renamel formulation is easy to work with, extremely wear-resistant, and highly esthetic. Renamel NANO comes in 12 shades in 5 g. syringes and .25 g. single use compules. For information on this new universal composite contact Cosmedent at 800-621-6729 or visit www.cosmedent.com. Like many dental offices, we have an assortment of prizes that kids can pick from when they are done with an appointment. We always try to find some fun and interesting things for them to choose from and sometimes that includes temporary tattoos. Along that line, I came across a site that sells inkjet temporary tattoo paper. What this means is that you can create sheets of tattoos of your own design. This can allow you to have tattoos with teeth, your logo, etc. Check out the company website here. Since it's the weekend and the summer vacation travel season is starting to unfold, I thought this would make good reading/information for those of you who visit my blog on a daily basis. A few years ago Google started the Google Earth project which basically allows users to see and find different parts of the world. Using a combination of satellite and ground level photos, Goolge Earth is a pretty fascinating piece of software. As it has gained popularity, some businesses have begun to use it to promote themselves. The latest to do this in a BIG way is Walt Disney World. Here is the article from CNN. Check it out. YouMail (www.youmail.com) is a great service that I've been using for a while now. It's a voicemail service that uses a web interface that allows you to access your voicemail from your phone or the web. It also sends you an e-mail and a text message whenever you have voicemail. Now the company has announced a web based visual voicemail system. You can see your messages, reply, save, forward, and a myriad of other things all from your phone. I highly recommend YouMail. Check it out. Western Digital has a new product. A hard drive with movable parts that is designed to help itself survive a drop. Standard hard drives work with a spinning platters and an arm that reads them, sort of like a vinyl record and a stylus arm. The obvious problem with this design is when the drive is dropped or bumped and the arm comes crashing down onto the platter. This can cause disk damage and data loss. Free-fall sensor - As an added layer of protection, if the drive (or the system it’s in) is dropped while in use, WD’s free-fall sensor detects that the drive is falling and, in less than 200 milliseconds, parks the head to help prevent damage and data loss. You can read more about this new technology here. patients,” stated Donna Janson, President and Chief Executive Officer of Novalar. Over 300 million cartridges of local dental anesthetic are sold each year in the U.S.
time to normal sensation and function following local dental anesthesia. private clinics. There were 484 dental patients enrolled across the two studies. acceleration of the time to normal sensation. age or weighing less than 15 kg (33 lbs). I've been using the Hydro Floss for over 2 weeks now and here are my impressions. Quality - The device is solid and well built. Nothing "flimsy" or substandard about it. It appears to be built to last. The packaging is good and sturdy. It comes with a CD that explains the usage and cleaning of the device. Usage - In my practice we encourage our patients to purchase oral irrigators and I've enjoyed the Hydro Floss. I've made it part of my nightly regimen since I received it. Even after careful brushing with & flossing, the device will sometimes flush out small pieces of debris that were left behind. Tips - The device comes with 4 color coded tips so that 4 different family members can use the device. There are other tips available from the manufacturer. Cleanable - The device is easy to clean and maintain. Overall - I'm pleased with the Hydro Floss and its performance. IIn a short period of time it has become something that I enjoy using and will continue to use. For more info or to purchase, click here for the company website. On Friday May 30, Microsoft issued a security bulletin advising users that have installed Safari for Windows to discontinue use of the browser until a patch can be developed and deployed. It seems there is what is being called a "blended threat" of a vulnerability between Safari and the Windows operating system. This threat can allow an unauthorized user to install programs without the knowledge or permission of the computer owner. Microsoft's official position is: "Restrict use of Safari as a Web browser until an appropriate update is available from Microsoft and/or Apple". Just one more reason to use Firefox, in my opinion.